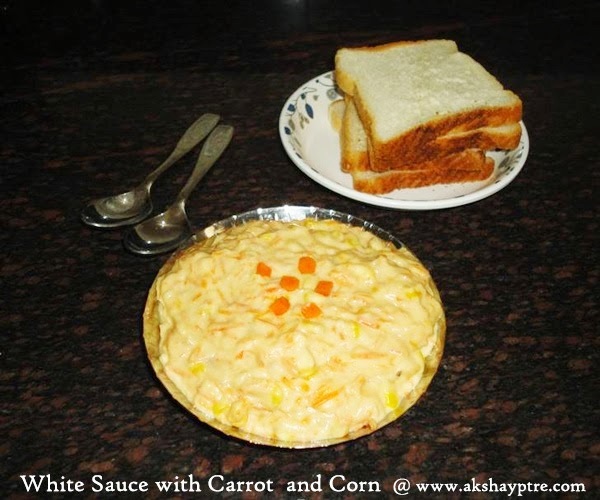 White sauce for bread sandwiches and pasta dishes recipe - Today I am going to share a basic recipe of white sauce which has multiple use in making bread sandwiches and various pasta delights. The use of this white sauce, transforms the above mentioned simple dishes into a fancy delectable dish which would attract both kids and adults. Above all, this sauce can be stored in the refrigerator for about a week as it is very handy and can be used during busy hours to make sandwiches and pasta dishes. 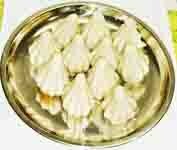 White sauce is prepared using refined flour, milk, sweet corn and carrots and is a favorite sauce of North India among many. It is a healthy, tasty and good sauce to make delicious snacks which is liked by all age group people and every one loves it in my home. The recipe makes 8 - 10 sandwiches or base for 4 serving pasta dishes. Carrot and sweet corn are optional. By adding these the taste of sauce enhances. You can also use thinly chopped beans with this recipe. Do not add salt while boiling or when the sauce is in thin consistency. Once the sauce becomes thick, add salt, mix well and remove from the flame. 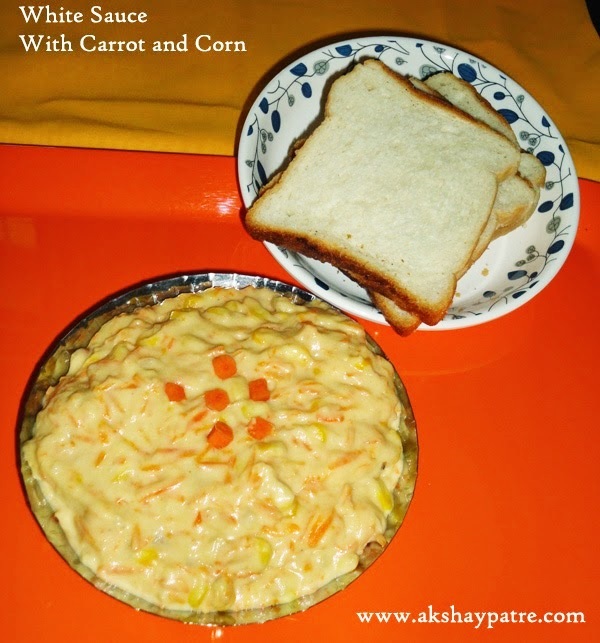 Delicious and healthy white sauce prepared with milk, refined flour or maida, sweet corn and carrots. This is useful in making sandwiches and various pasta dishes. Heat the butter in a pan and fry the refined flour nicely for 10 minutes. Add the milk and water and mix stirring continuously to prevent the refined flour turns into lump. Bring it to boil, then add the grated carrot, sweet corn and sugar. Boil it on low flame till the corn cooks well. Then simmer the sauce till it becomes thick. Once it becomes thick, add the salt and mix well. Remove and store it in the fridge. This sauce can be stored in the refrigerator for about a week. This white sauce is useful in making bread sandwiches and various pasta dishes. Nice recipe, would make a delicious sauce for pasta!